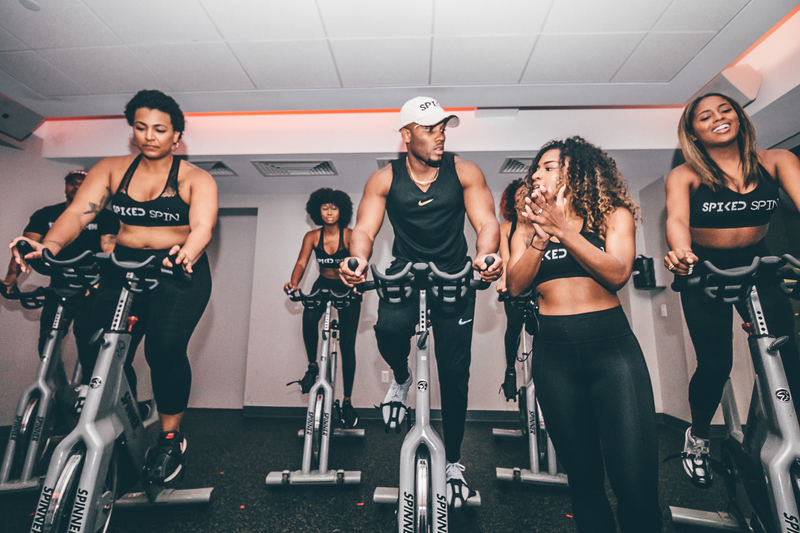 Spiked Spin is Owens’ creation — a hip-hop inspired soul-cleansing physical sermon moonlighting as a high-intensity spin class. Her target: wellness issues in the black community. Owens’ is about “generational health.” It’s what wakes her up at 6:30 every morning. But in the nearly two years since Spiked got off the ground in New York City, the paranoia of the days, weeks, hours and minutes leading into her inaugural event stay with her. “Treat everything like your first project” is advice Biggie Smalls offered with regard to staying humble — and it’s advice Owens, born in Queens, New York, follows daily. Before Spiked, many knew her as an interactive and detail-oriented part-time spin instructor at a private gym in Columbus Circle in Manhattan. That Owens embarked on her own path in came as no shock to friends and family who knew of her ambitions as a rider. That “something” continues to evolve in the $3.7 trillion global wellness industry, according to figures from the Global Wellness Institute. Fitness and mind-body, which Owens specializes in, accounts for $532 billion. 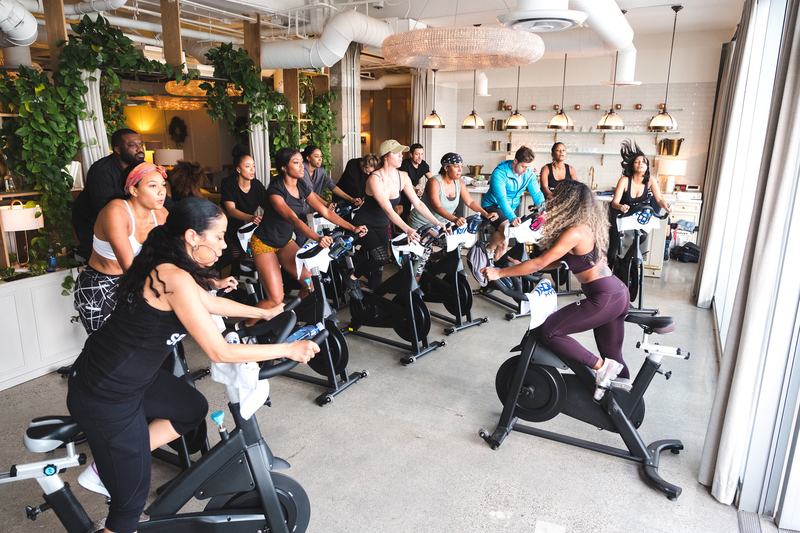 Yet it’s an industry where black women are traditionally underrepresented, though awareness of the problem has inspired a new wave of women of color to punch their way in via avenues such as fitness, spin classes, yoga and more. Spiked Spin still takes place at 10 Hanover Square — her home base until the brand’s flagship, permanent headquarters open, “very soon.” In the past year and a half, Owens said, Spiked has opened its New York doors to at least 1,600 women and men — many who look just like her. The numbers don’t include the pop-ups Spiked has held in Washington, D.C., Atlanta and Los Angeles. Having already been featured in several outlets, the 2011 Hampton University alum is humbled by the continued growth of her class, her brand and, most importantly, her as a woman. She credits the omission she saw in the industry as inspiration, but she’s equally as complimentary to her longtime boyfriend Zach, whom she frequently features both on her personal and work Instagram pages. What’s next for Owens, Spiked Spin and the health and wellness industry? One thing’s for certain. Owens has something to say. Music is obviously an integral aspect of working out in general. But why is particularly important with Spiked? Full transparency — the whole idea for Spiked came from music. Before I even thought of this as a business … I was teaching classes and having to download music that would never be on my iTunes. I was having to talk to co-workers or look up Top 40 and look up all these songs that I would never listen to in my personal life. I loved my classes and I loved the students who came to my classes, but I realized this is the kind of music they like and if I want us to have a good workout … that’s where I got my first idea saying I’m going to teach a class with hip-hop. Instead of playing Taylor Swift, I just wanna hear Future. I don’t even wanna do the Beyoncé vs. Jay Z. I wanna hear ’93 Ice Cube. I wanna go in! You can come to Spiked Spin and hear Eazy-E or you could hear Drake or Luther Vandross. It is always gonna be hip-hop, R&B and soul, because that’s who I am. I think of it like when you go to the club. If the music isn’t poppin’, you don’t wanna go. Before we go somewhere in New York or Atlanta, we always ask, ‘What’s the music?’ That’s how I approach the class. The vibe has to be right. But how do you find time for balance in your life with CBS, Spiked, your personal and social lives? Especially in a city like New York. It’s definitely a challenge! As Spiked is growing, I’m learning how to be more creative and fluid with my time. As much as people think I’m doing so much socially, there are a lot of things I don’t get to do socially because I’m usually, if I’m not at work, I’m teaching class. If I’m not teaching class, then I’m usually doing something relevant with Spiked. Don’t even talk about what your body looks like. What is your heart doing? I wake up early. That’s something I’ve had to commit myself to because, trust me, I love to sleep! But I don’t have that luxury as much now. I usually try to get my day started around 6:30 a.m. so I still have time to work out for myself. Then I go to work. Then I go teach. And after teaching, I focus on anything that I have to do for Spiked. I’m extremely organized. I think that’s something that has helped me for a long time. The issue of women of color in the health and wellness space has become a necessary topic of conversation. But since you’ve really been immersed in this field, what have you seen as the biggest example of progress? When it comes to those … who are not as educated on the field, or live in lower-income areas, they have the least amount of awareness. That’s where, for me, there’s trouble. And there’s trouble [where] people who are aware of wellness and enjoy it … they deserve to have an experience that keeps them in mind. They shouldn’t have to go to a class that only plays a certain type of music or only have a certain type of instructor. And then there’s also that set of demographics who no one even thinks about. No one’s talking to. They [can be] unaware of just the basic things, like moving for your heart. Don’t even talk about what your body looks like. What is your heart doing? Do you know you’re at a higher risk of diabetes, high blood pressure, kidney failure? All these things. Those are the conversations that are not even being had. Before we even get to body image, foundationally there’s a miseducation. Within our community, there are levels. And with those levels, look up health statistics. There’s a direct correlation with income and health. There are definitely strides being made. There is some representation. Is there opportunity for more? Of course. One person can’t do it. How many more people can be inspired to be part of this conversation, and figure out how to reach the people? So we can have a larger effect on what I call #generationalhealth. What was the moment when you realized this passion of yours was becoming your new reality? It’s something that’s been happening over time. Spiked Spin started as a ‘business’ because people paid for my service. I didn’t even realize the passion that I had for the conversation element of it. And for the importance of it beyond the class. It literally just started as a class. Like, here’s a cool workout that’s hip-hop. It’s fun. I am my No. 1 target audience. That’s where it started. Since then I have met so many people, men and women, who have literally cried and said, ‘I needed this. Beyond the classes, I needed to feel like I’m important. I needed to feel like I can do more than whatever I thought I could do.’ That’s when I started to say this is bigger than the class. This is a conversation. This is empowerment. These are people who have not felt like they mattered in the space. My one-on-one conversations with people are where I really find the drive to keep going. Pursuing your passion as a woman of color in this space … how important is it to have a partner [her boyfriend of seven years and college classmate Zach Thompson] by your side in this journey? It’s something that gets overlooked when we hear success stories. It’s actually one of the best things. We’ve been together since I was 21 years old. I’ve been about 20 different people in these seven years. He’s seen the evolution to this point … little things that most people probably don’t pay attention to, but when I take a second to reflect, I realize how much of who I am is directly correlated with … things that he has seen in me before I even saw them in myself. Him just being supportive like when I come home and say, ‘I wanna start this business.’ He doesn’t say is this a crazy phase. He’s like, ‘Aight, let’s do this.’ He’s always, always, always been supportive. It feels good because in this process there are people who support me wholeheartedly and there are people who don’t. It’s just nice to see he’s remained consistent all the way through my hardest days when I’m probably just yelling at him over something that has nothing to do with him. He gets me. It’s nice to have someone who isn’t a business partner. He has no skin in the game aside from wanting to see me win. But he’s still 100 percent in as if it were his baby, too. the Genuis thing that we did was, we didn’t give up. – HOV ✊🏽✊🏾✊🏿 #TheSpikedWay #blackhistory – Drop a shout to your people, spread L O V E! How much of a blessing has it been to really see the support of your community? The classes are inclusive to everybody, but what does it make you feel when you see a room full of carefree black women really getting something out of your classes? In real time, it’s (pauses) literally the best feeling. That’s because I realize I’m not the only one getting something out of it. Whatever they’re getting from it, they consistently get it and they feel good about it. The room is filled with electric energy. Just so much love and support. It’s not only just women. It’s women and men. We end every single class with what we call ‘The Spiked Way.’ It’s a few moments of reflection, of support, of love, self-acceptance. You can tell those are the things the room is filled with the entire time. It’s an overwhelming feeling of excellence. It feels so, so great.